My husband and I decided to take the Sunset Tour on Scotch Mist based on the hundreds of positive reviews on Trip Advisor, and it was exactly what we expected and hoped for! We were booked on the Scotch Mist II, a Legendary Santa Cruz 50 foot sailing yacht (my husband’s a boatie, so he knew all about it) – amidst many much larger ships in the harbour. When you board the boat, you can’t help but notice how the people on the larger cruise ships around you are being herded on like cattle. We were so glad we didn’t book on one of them! There were 12 guests aboard our boat plus 4 staff, which was perfect – the yacht is very roomy with plenty of space to relax, but still feels intimate and comfortable, like a friend’s taking you out on their boat. This is a true sailing experience, and I would not have had it any other way! We were so glad we followed the advise of other Trip Advisor fans. Captain Gene and the crew were incredibly friendly, helpful and shared their love of sailing and Maui with their guests. It felt more like you were sailing with friends who had arranged a special get-together for you than going out on a charter. Champagne, wine, beer and soft drinks were offered continuously. 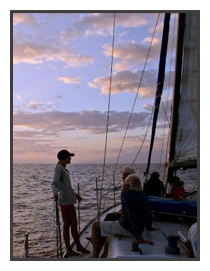 The sunset was absolutely glorious, and being out on the waters around Maui is an experience like no other! Seeing the West Maui Mountains with the orange glow of the sunset, and the purple and blue clouds in the sky is truly breathtaking. Scotch Mist is highly recommended to anyone – especially for those who are looking for a more relaxed and unforgettable sunset experience. 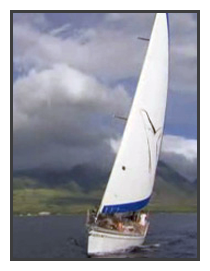 You can visit them on the web at ScotchMistSailingCharters.com, or call to book a trip at (808) 661-0386. Unforgettable!